Jason Ellis, P.L.S. Promoted to Survey Manager in Boston Office | Hancock Survey Associates Inc.
Jason Ellis, P.L.S., one of Hancock Associates’ Project Managers and an Associate of the firm, has accepted the position of Survey Manager for our new Boston office. 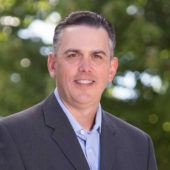 Jason has over 20 years of experience in land surveying and broad knowledge of the technical and legal aspects of utility, residential, commercial and municipal surveying projects. He’ll be working hand-in-hand with H.W. Moore’s engineering team.